Here we will tell you top 10 International Cricket Players who died during cricket match, few of them were died on the spot in cricket ground and few of them were died at hospital after getting injury during match. Cricket is world famous sport which is played around the different countries of world and also most watched sport in the world. Cricket is not very much risky sport as compare to other like Car Racing, Bike Racing but risk is also there in cricket. Below are the details about the International Cricket Players Who Died During Cricket Match, Country, like player name, country, age, reason o death etch. Andy Ducat famous player of England died on the pitch during a club match while batting at Lord’s in July 1942. Andy Ducat who played only one test for England, suffered a heart attack during batting. Abdul Aziz died during the final match of Quaid-e-Azam Trophy domestic cricket tournament in 1958-59. The 17 years old batsman Abdul Aziz was facing an off-spinner bowler, ball rose sharply and strike his chest. He got injured and was declared dead at the hospital. Wilf Slack famous player of England get injured during match while batting in Banjul in January 1989 at the age of 34. Ian Folley player of English team died during a domestic cricket match in 1993 due to freak accident. Lan Folley was hit below the eye while batting for Derbyshire against Workington. He got a heart attack and was declared dead later in hospital. Raman Lamba good player of Indian Team died after hitting a ball during a cricket match when he was doing fielding in Dhaka Bangladesh 1998. The ball stroked him on the head, while standing at short-leg without wearing helmet. After hitting of ball on his head, he went into a coma 3 days after the incident and then died in hospital. Waseem Raja died with his boots on, he was playing in a 50 Overs One Day Match at Surrey 2006. During match Waseem Raja Pakistani’s batsman began complaining of restlessness. Soon he collapsed on the field, faced a massive heart attack, leaving everyone shocked he died. Richard Beaumont nice player of England collapsed on the pitch, suffering a suspected heart attack in 2012 during match and was announced dead shortly after his arrival in hospital. Zulfiqar Bhatti of Pakistan during a domestic match in 2013, after being hit a bouncer on his chest while he was batting during math, he collapsed on the ground and was moved to hospital in emergency, but dead on arrival at hospital. Darryn Randall South African player died when a ball hit on his head in a domestic match in 2013. The ball was hit on his head while attempting a pullshot, he died on the spot. Phill Hughes very famous player of Australia died at the St. Vincent’s hospital on 27th Nov 2014. He succumbed to his injuries after fighting for life for two days after being hit a bouncer on his head. 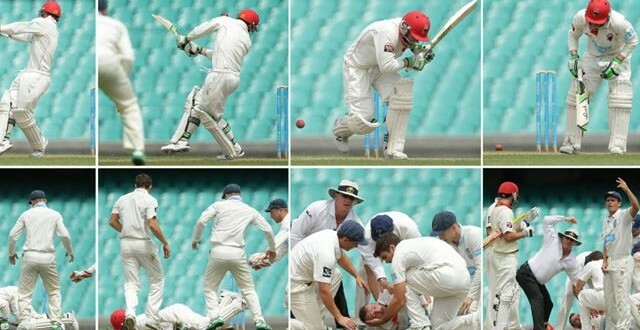 He was struck on the head with a short pitched delivery from Pacer Sean Abbott during match. The International Cricket Players Who Died During Cricket Match are evergreen in the history of cricket.